Karbonn A1+ was a good Android mobile phone in it’s range when it was launched. It was sold in a high quantity at the initial time of launching. But after some customer’s complaints and problems faced by customers at service centers, the selling of this phone is decreased suddenly. Anyways, this is not our concern. I got a Karbonn A1+ by redeeming some points I got by Airtel India as a retail partner. I purchased this phone, because there was not other good phone in the range of my currency points. I was eagerly waiting for that phone, as it was my first Android smart phone. I thought it would be a great phone according to its specifications displayed online. But when I got this phone in my hands, I became very disappointed. I just used this phone just for making calls for about 2 months. After that, I faced many problems in this phone. One day I thought to ROOT the phone. I searched over the internet, and found some tricks. During this, I bricked phone (My touch pad stopped working). I could not root this because there is still no working trick to root this phone. I give my phone to some senior mobile repairer professional to refurbish the phone’s software, because the touch stooped working due to some file corruption.Nobody could flash this phone. I myself also tried flashing this phone, but all in vain. There is a specific tool for Karbonn A1+ for flashing. We need the package fine for appropriate H/W and S/W version. My phones H/W version is 3.0.0 and S/W version is 2.0.7. As this was a new version, I was unable to get the flash files for this version also. Although I already downloaded the latest files which are version 2.0.8. I will be giving the links for all the required files at the end. As it is a Spredtrum based CPU phone, we have to modify the standard micro USB cable. Packages File for appropriate H/W and S/W version (Links will be given at the end). Now go to setting and click on HWInfoImg file and select file with this name – XYL_XYL635143-1B_ILI9487_35_CMO_KMOEB_PZ286_DZTX_HW_info. Now click on start, connect the cable and immediately press the power key. If you do not immediately press the power key, it will not detect or you will get some other problem. Install the drivers provided with the tool. Do not install other drivers. Withing a few seconds, your phone will be flashed and it will shoe Passed. Not Service (IMEI problem) CFT not callibrate. To solve these problems, one by one change the HWInfoImg file in the folder bin>>HW_info>>PZ286_DZTX_HW_info>>KMOEB. Karbonn A1+ Latest Flash Files ver 2.0.8 for new Hardware version (With All HWInfoImg files). Extra Spreadtrum Drivers for Karbonn A1+. I tried to include almost everything here, but if you do not find anything you are searching for, please push a comment. I will try to help you as soon as possible. I even faced many problems in facing this phone. Did you modified the cable.? 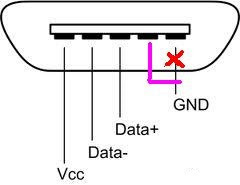 how to modify the cable? pls say eloborately in which i hav to change the wire? Dude, there are total 5 pins and 4 wires in the Jack. Remove the black wire from it's place and attach it to the one which is blank. Dude i ve oly 4 pins in the jack… wat shud i do?? Try another cable. In fact there are always 5 pins in a standard micro USB cable. wether can i use some other versions to flash my mobile?? Rooting of Karbonn A1+ is still not possible. Don't ever try, because I had almost bricked my phone. Though I have not tried, according to my other experience, I can only say it would not work. But if you have the backup of original files, you can give a try. Post your result if you do that. Open the UpgradeDownload S/W. There are total 5 icons at top left. First is for loading the packet file (*.pac). The second is for the setting where you have to select the HWInfoImg file. Try again and post your result. Good Luck..! Remove the battery and the cable from the phone. Now insert the battery. Now quickly insert the USB cable to the phone and press and hold the power key of phone. Make sure you have already clicked the Start button of the tool. Dial *#*#889988#*#* or Dial *#*#889933#*#* from your mobile and tell me what you are seeing there. I have karbonn a1+ its not detecting My Idea SIM Card (mobile network is not available) while same sim card is working fine on another any mobile. I have taken new sim card from Idea gallery this is also not working, And I have one another Vodafone sim card which is working properly. please help me to resolve my issue….. Try flashing the phone by following above steps. If it is under warranty, please go to service center once. Can u plz take a pic and post.? did i have to push and hold the power buttion till my phone get on.. or have to rlerase it before. how much time it takes to done ..
karbonn a1+ imei change how to repair orignal imei n.
sir I have karbnn a1+ data cable yet I need to modify it. because this time I m trying upgrade download tool show wait …. Thank you for letting me know. Will be updating the links soon.